Is Donald Trump still a fan of Wikileaks? Would he still say, as he did in January, that he’d sooner believe Julian Assange than his own intelligence services? Trump has repeatedly attacked US intelligence agencies – going as far as comparing them to the Nazi regime – while openly cheering for WikiLeaks. He has also alleged, without any evidence, that the Obama administration spied on him and his election campaign. The latest WikiLeaks document dump about the CIA’s computer hacking tools comes in the midst of a very public feud between Trump and the US intelligence agencies over Putin’s intervention into the presidential election in Trump’s favour. 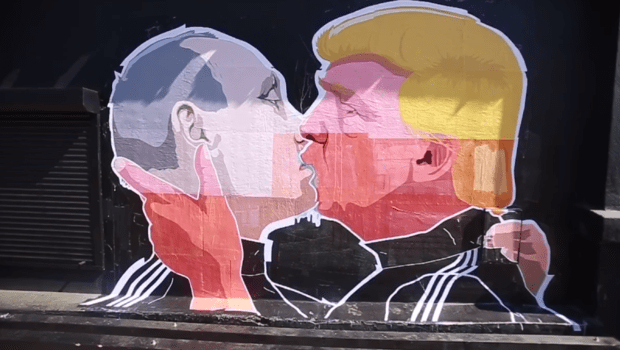 It seems likely that the new WikiLeaks revelations are intended to help Trump, and emanate from the Putin regime, which has long been using WikiLeaks to further its agenda in the west and to undermine bourgeois democracy from the extreme right. The WikiLeaks press release highlights the CIA’s “Umbrage” group, said to collect a library of hacking tools used by intelligence agencies of foreign countries, “including the Russian Federation”, allowing them to conduct false flag operations. “With Umbrage and related projects the CIA cannot only increase its total number of attack types but also misdirect attribution by leaving behind the ‘fingerprints’ of the groups that the attack techniques were stolen from,” WikiLeaks said. James Lewis, senior vice-president at the Centre for Strategic and International Studies and an expert on cyber security, speculated that the motive behind the leak could be to underpin the false flag conspiracy theories and evasions of the Trump camp. “Mr Trump, who last year angrily dismissed the conclusion of intelligence officials that the Russians interfered in the presidential election to boost his candidacy, has now asked both his staff and a congressional committee investigating Moscow’s influence on the election to turn up evidence that Mr Obama led an effort to spy on him,” he said. Perceptions of WikiLeaks in the west – and on the liberal-left in particular – have changed since the organisation’s 2010 release of huge numbers of classified US documents from the Afghanistan and Iraq wars, as well as US embassies around the world. WikiLeaks was then widely supported by opponents of those wars and by advocates of greater transparency on the part of western governments. Roger Stone, a former Trump adviser, wrote on Saturday night that he had a “perfectly legal back channel” to WikiLeaks’ founder, Julian Assange. Stone then deleted the message. In early January, the CIA, National Security Administration (NSA) and FBI assessed with “high confidence” that Russian military intelligence was behind the anonymous hackers Guccifer 2.0 and DCLeaks.com, which stole data from prominent Democrats and passed it on to WikiLeaks. “Moscow most likely chose WikiLeaks because of its self-proclaimed reputation for authenticity. Disclosures through WikiLeaks did not contain any evident forgeries,” the agencies found. Assange has insisted that the documents did not come from Russian sources, although the organisation also says that in most cases it does not know the sources of the data passed on to it. In a press release announcing the latest document dump, WikiLeaks suggested that the original source was a former US government hacker or contractor. Assange has been living in the Ecuadorian embassy in London for more than four years, since Sweden sought his extradition for questioning on an accusation of sexual assault. In that time, he has hosted his own show on the Russian state-run television channel RT (formerly Russia Today). WikiLeaks has published little or no material that could be seen as damaging to Russia, although Assange has argued that is because the leaks the organisation receives are overwhelmingly in English, while Russian-language material finds its way to other outlets. WikiLeaks has also published material helpful to pro-Putin far-right parties in France and Germany, suggesting that it will seek to influence the forthcoming French presidential election in favour of Marine Le Pen and the German election in favour of the neo-nazi Alternative for Germany (AfD). Meanwhile, Trump may be regretting his outspoken support for Assange and WikiLeaks, as allegations of Russian influence dog his White House, and the threat of impeachment begins to look like a realistic possibility. JD would like to acknowledge the work of Julian Borger in the Guardian, which has provided him with much of the information used in this post. Thanks Dave: I must emphasise that it was a hastily-written hack-piece, making extensive use of Julian Borger in the Guardian and an unattributed “Analysis” piece in today’s Times. I added the politics. Wikileaks only put out Hillary’s emails. Even if Russia pulled the strings, it was still her blunder using the same kind of domestic grade server the rest of us look at our cat videos through. Had it been some Republican senator, the left would have blamed the politician. Instead, the Dems clamour for impeachment anyway, every day. They lost and should get over themselves. And what did Russia actually do to rig the election, as always implied but never proved? Hacked the hostile media to be more friendly to Trump, or reprogrammed voters’ brains by satellite? I would have thought collaboration with a hostile foreign power was grounds for impeachment … wouldn’t you, Mick? Indeed. But there’s no evidence of that. Trump’s opponents keep shooting their bolts too early, which does help Trump. The Dems and their supporters are becoming either the boys who cry wolf, or simply covered in too much tinfoil. The left are lying when they say there was no wiretapping. It turns out that Cathy Areu, liberal journalist and onetime White House adviser, had it confirmed by a White House source that Obama DID tap Trump Tower. Even the Guardian last year reported the FBI applied for, and received, court permission to wiretap the Trump team over supposedly dodgy contacts with Russia. But yes, how flaky are lefties over Wikileaks. The Wikis were heroes when the BNP membership list was leaked, too. Now they wail and gnash because, horrors, Assange liked Trump. These repellent people are governed way too much by their erratic tempers, I’m afraid, which is also how the head of the FBI is either a devil or a saint, depending on whether he was investigating Hillary that day. Mick: who, exactly, has said that “the head of the FBI” (ie Comey) is a “saint”? Name names, please? That Newsweek article does seem fair enough but it could have provided some extra context, in my own humble opinion. Mr Comey denied involvement but he would be a rubbish FBI boss if he just answered every random question he was asked. Also, Trump’s tweets betray no national secrets. They’re only ever generalisations with info only in the public domain. Criticising those for a lack of substance is just fake news. And its whole ‘no smoke without fire’ conclusions? Suspicions and circumstantial evidence – if that – are usually just presented slickly enough to get bugging permission. (And driven by the Obama administration? Let’s investigate that!) All you’re doing is fishing when you bug, else the case would likely have been already closed by the election. So far, we’ve only just a bunch of smoke which Trump’s opponents have concocted. “So far, we’ve only just a bunch of smoke which Trump’s opponents have concocted”: we’ll see, eh, when Putin’s man is properly investigated, exposed and impeached. You have admitted, then, you have no evidence, even by now. Tomorrow is tomorrow but there’s nothing in anything now. Trump has dispatched troops to Europe to bolster NATO. Trump has demanded NATO members pay their agreed contribution. A US armoured brigade had been deployed on the Polish border. The US CIA helped destabilise the Ukraine. Potentially a real war could ensue because of NATO expansion. British soldiers could die. Mr Jim Denholm as a socialist you seem content to see the capitalist expansion eastwards towards Russia. You mean Russia *isn’t* capitalist?!? No I did not mean that and you are just evading my comment. Why as a socialist and I assume you are anti capitalist not condemning capitalist NATO encroaching on capitalist Russia. You are the stooge of Liberalism. The former UKIP leader refused to answer questions on whether he was visiting Julian Assange, editor-in-chief of Wikileaks, who has been in the building since 2012 after applying for political asylum. Assange faces allegations of sexual assault in Sweden, which he has denied. Earth moving event probably caught MI6 by surprise.